A sonar survey in 2001 along the ultraslow-spreading Gakkel Ridge (formerly known as the Nansen Cordillera and Arctic Mid-Ocean Ridge) by the USS Hawkbill submarine and the U.S. Coast Guard icebreaker Healy revealed two previously undiscovered volcanoes beneath the pack ice of the Arctic Ocean (BGVN 26:03). In July 2007, a research team led by Woods Hole Oceanographic Institution (WHOI) uncovered evidence of explosive volcanic eruptions in the same area of the seafloor. At a depth of ~ 4 km, researchers found fresh, unweathered, jagged, glassy fragments of rock (pyroclastic deposits) spread out over an area of ~ 10 km2 around a series of small volcanic craters on the Gakkel Ridge (figure 1). According to WHOI geophysicist Rob Reves-Sohn, chief scientist of the expedition, as quoted in the 14 August 2008 issue of Oceanus, "These are the first pyroclastic deposits we've ever found in such deep water, at oppressive pressures that inhibit the formation of steam, and many people thought this was not possible. This means that a tremendous blast of carbon dioxide was released into the water column during the explosive eruption." Although no speculation was made by the scientists as to the age of the eruption(s) that caused these pyroclastics, the fresh nature of these surficial materials argue to their recency. Figure 1. Detailed bathymetry (30-m grid spacing) of the Gakkel Ridge at 85°E in the Arctic Ocean based on July 2007 WHOI research cruise. The inset map shows the location of the 85°E segment (yellow star) along the Gakkel ridge (red line) in the Arctic basin. The main panel shows illuminated, color bathymetry of the 85° E segment acquired during the Arctic Gakkel Vents (AGAVE) expedition. The axial valley contains large numbers of distinctive, cratered volcanoes, including a cone on a fault terrace of the northern valley wall. Photographic bottom surveys were conducted along profiles shown as thin black lines on the map. Pyroclastic deposit samples were collected at sites shown by white circles, and the photographs shown in figure 2 were taken at the sites shown by the lettered (red) stars. Named features include two volcanic ridges in the center of the axial valley (Jessica's hill and Duque's hill), and three cratered volcanoes along a ridge-parallel fissure to the S (Oden, Thor, and Loke). Courtesy of Sohn and others (2008). According to Cochran (2008), the Gakkel Ridge is the slowest spreading portion of the global system of mid-ocean ridges. Total spreading rates vary from 12.8 mm/yr near Greenland to 6.5 mm/yr at the Siberian margin. A recent article by Sohn and others (2008) concerning the July 2007 expedition noted that roughly 60% of the Earth's outer surface is composed of oceanic crust formed by volcanic processes at mid-ocean ridges. Although only a small fraction of this vast volcanic terrain has been visually surveyed or sampled, the available evidence suggests that explosive eruptions are rare on mid-ocean ridges, particularly at depths below the critical point for seawater (a depth of ~ 3,000 m). A pyroclastic deposit has never been observed on the sea floor below 3,000 m, presumably because the volatile content of mid-ocean-ridge basalts is generally too low to produce the gas fractions required for fragmenting a magma at such high hydrostatic pressure. Liu and others (2008) reported on recent analyses of many major and trace element collected from Gakkel Ridge. The July 2007 expedition acquired photographs and video images of 'zero-age' volcanic terrain along the ridge and beneath the ice-cover ocean's surface. The axial valley at 4,000 m water depth was blanketed with unconsolidated pyroclastic deposits. Those included bubble-wall fragments (limu o Pele, also know as Pele's seaweed?fragments of large glass bubbles that shatter into pieces of curved, paper-thin, bubble walls), covering a large (greater than 10 km2) area (figure 2). At least 13.5 weight percent CO2 is necessary to fragment magma at these depths, which is about tenfold above the highest values previously measured in a mid-ocean-ridge basalt. Figure 2. Photographs of pyroclastic deposits taken during July 2007 WHOI research cruise. (a) One frame from a high-definition video camera taken on the S side of Duque's hill (see figure 1 for location). About 10 cm (visually estimated and confirmed during sampling) of pyroclastic material is piled atop a high-standing, weathered, pillow feature. The exoskeleton of an as yet unidentified species of hexactinellid sponge (glass sponge, or a sponge with a skeleton made of 4- and/or 6-pointed siliceous spicules) is visible in the foreground. (b) High-definition video frame grab of talus blocks possibly representing ejecta from a vulcanian explosion on Oden volcano (see figure 1 for location). (c) Glassy, granular, pyroclastic material. (d) Bubble wall fragment from pyroclastic deposit. Courtesy of Sohn and others (2008). Sohn and others (2008) note that these observations raise important questions about the accumulation and discharge of magmatic volatiles at ultraslow spreading rates on the Gakkel ridge. They also demonstrate that large-scale pyroclastic activity is possible along even the deepest portions of the global mid-ocean ridge volcanic system. References. Sohn, R.A., Willis, C., Humphris, S., Shank, T.M., Singh, H., Edmonds, H.N., Kunz, C., Hedman, U., Helmke, E., Jakuba, M., Liljebladh, B., Linder, J., Murphy, C., Nakamura, K., Sato, T., Schlindwein, V., Stranne, C., Tausenfreund, M., Upchurch, L., Winsor, P., Jakobsson., M., and Soule, A., 2008, Explosive volcanism on the ultraslow-spreading Gakkel ridge, Arctic Ocean: Nature, v. 453, p. 1236-1238 (doi:10.1038/nature07075). Cochran, J.R., 2008, Seamount volcanism along the Gakkel Ridge, Arctic Ocean, Geophysical Journal International, v. 174, no. 3, p. 1153-1173. Liu,C-Z, Snow, J.E., Hellebrand, E., Br?gmann, G., von der Handt, A., B?chl, A., and Hofmann, A.W., 2008, Ancient, highly heterogeneous mantle beneath Gakkel ridge, Arctic Ocean: Nature, v. 452, p. 311-316 (doi:10.1038/nature06688). Carlowicz, M., 2008, Deeply submerged volcanoes blow their tops: Telltale rocks reveal evidence of a phenomenon scientists thought was impossible: Oceanus, 14 August 2008. Information Contacts: Oceanus: The Online Magazine of Research from Woods Hole Oceanographic Institution (URL: http://www.whoi.edu/oceanus/). The Global Volcanism Program has no Weekly Reports available for East Gakkel Ridge at 85°E. A sonar survey along the ultraslow-spreading Gakkel Ridge by the USS Hawkbill submarine revealed two previously undiscovered volcanoes beneath the pack ice of the Arctic Ocean. Lineated magnetic anomalies over the entire ridge suggested that seafloor volcanism occurred there, but theoretical modeling predicted that melt production should be extremely low given the ~1.0-1.3 cm/year rate at which the ridge spreads. Sidescan and bathymetric data from the East Gakkel Ridge survey showed two amorphously shaped topographic highs with 1,000 m (eastern volcano) and 500 m (western volcano) of relative relief, with a highly reflective acoustic character. The high reflectivity was interpreted to indicate a lack of significant sedimentary cover on young basaltic flows. Edwards and others (2001) reported that "portions of the strongly reflective regions . . . abut lineaments, consistent with the ponding of lava against fault scarps. Terminations of acoustically reflective terrain in regions devoid of lineaments have shapes characteristic of lava flow fronts . . .. These flow toes are radially distributed about the two topographic highs. The morphology of the strongly reflective regions is consistent with submarine volcanic flow systems mapped at other mid-ocean ridges by acoustic and optical [methods] . . . . The two acoustically reflective regions are thus probably volcanoes that are largely devoid of sediment cover, and therefore erupted recently. The presence of these two young volcanoes covering approximately 20% of the 3,750 km2 surveyed along . . . the eastern Gakkel Ridge, proves that significant volcanism occurs at ultraslow spreading rates." During January-September 1999 global seismic networks detected an earthquake swarm corresponding to the approximate location of the W volcano discovered along the East Gakkel Ridge (86°N, 85°E). About 75% of the swarm occurred before the end of May. Edwards and others (2001) noted that "The correlation between the locations of the earthquake epicenters and the location of the strongly reflective, untectonized W volcano together with the volcanic character of the seismic record provide evidence that lava erupted on the E Gakkel Ridge . . . . Because 12-kHz sonars can penetrate through thin sediments covering acoustically reflective lavas, it is possible that no eruption occurred on Gakkel Ridge in 1999; however, historical global seismic records indicate that this is the only earthquake swarm detected on Gakkel Ridge in about 100 years." Reference. Edwards, M.H., Kurras, G.J., Tolstoy, M., Bohnenstiehl, D.R., Coakley, B.J., and Cochran, J.R., 2001, Evidence of recent volcanic activity on the ultraslow-spreading Gakkel Ridge: Nature, v. 409, no. 6822, p. 808-812. Information Contacts: M.H. Edwards, Hawaii Institute of Geophysics and Planetology, School of Ocean and Earth Science and Technology, University of Hawaii at Manoa, POST 815, 1680 East-West Road, Honolulu, Hawaii 96822 USA (URL: http://www.soest.hawaii.edu/HMRG/cms/). During January-September 1999 global seismic networks detected an earthquake swarm along the East Gakkel Ridge (near 86°N, 85°E). Sonar mapping in May 1999 identified a cone at the western end of a line of volcanoes that corresponded to the average location of the epicenters (Edwards et al., 2001). 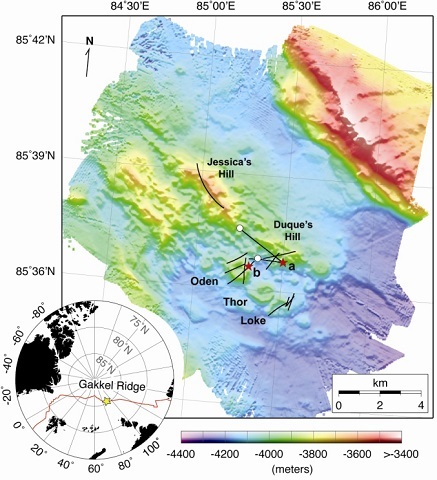 A survey in July 2007 (Sohn et al., 2008) provided detailed bathymetry and named selected features, including the Oden (location of the 1999 seismicity), Thor, and Loke cones. Both Oden and Loke were covered with a light dusting of pyroclastic material, which was also found throughout the survey area, thought to be products of an eruption during the 1999 swarm. Edwards M H, Kurras G J, Tolstoy M, Bohnenstiehl D R, Coakley B J, Cochran J R, 2001. Evidence of recent volcanic activity on the ultraslow-spreading Gakkel Ridge. Nature, 409: 808-812. Tolstoy M, Bohnenstiehl D R, Edwards M H, Kurras G J, 2001. Seismic character of volcanic activity at the ultraslow-spreading Gakkel Ridge. Geology, v. 29, no. 12, p. 1139-1142. Vogt P, 2003. (pers. comm.). There is no Deformation History data available for East Gakkel Ridge at 85°E. There is no Emissions History data available for East Gakkel Ridge at 85°E. Detailed bathymetry (30m grid spacing) of the Gakkel ridge at 85 E in the Arctic Ocean. The inset map shows the location of the 85 E segment (yellow star) along the Gakkel ridge (red line) in the Arctic basin. The main panel shows illuminated, colour bathymetry of the 85 E segment acquired during the AGAVE expedition. The axial valley contains large numbers of distinctive, cratered volcanoes, including a cone on a fault terrace of the northern valley wall. Named features include two volcanic ridges in the centre of the axial valley (Jessica’s hill and Duque’s hill), and three cratered volcanoes along a ridge-parallel fissure to the south (Oden, Thor and Loke). The bathymetry data were plotted with Generic Mapping Tools. Sohn et al., 2008. Explosive volcanism on the ultraslow-spreading Gakkel ridge, Arctic Ocean. Nature, v. 453, p. 1236-1238. The Global Volcanism Program has no maps available for East Gakkel Ridge at 85°E. There are no samples for East Gakkel Ridge at 85°E in the Smithsonian's NMNH Department of Mineral Sciences Rock and Ore collection. Large Eruptions of East Gakkel Ridge at 85°E Information about large Quaternary eruptions (VEI >= 4) is cataloged in the Large Magnitude Explosive Volcanic Eruptions (LaMEVE) database of the Volcano Global Risk Identification and Analysis Project (VOGRIPA).